Another offering from an old issue of Cooking Light magazine. If you eat three or more, however, I believe they no longer qualify as "light." 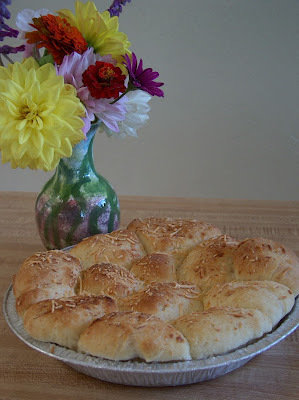 The magazine directs you to start with frozen bread dough (you can find this in the freezer section at the supermarket), but my handy dandy bread machine is so easy to use, I whipped up a batch of homemade white bread dough to use instead. What this recipe does that I'd never seen before is instruct you to roll out the dough and spray it with cooking spray before sprinkling on the sugar/cinnamon mixture. No extra butter or oil in that layer. That must save a few calories right there. Combine the sugar with the cinnamon. On a lightly floured surface, roll out the dough until it makes a 16 x 12 inch rectangle. Spray lightly with cooking spray; sprinkle cinnamon sugar over all. Coat dough again with spray. Starting with 12-inch end, roll up tightly. Pinch ends and seams well so none of the cinnamon-sugar goodness escapes. In small heat-proof bowl, microwave honey for 20 seconds on high. Pour honey into 9-inch round cake pan (I used a pie tin), tilting so honey coats the bottom of whole pan. Sprinkle with brown sugar (and pecans, if you're using them). When you take them out of the oven, immediately invert the pan onto a serving plate. These are especially yummy when warm. Makes 12, about 225 calories each. Doing any baking at your house? I'd love to hear about it. Other than baking on a tan outside, nothing especially lovely coming from my oven other than a box mix brownie here or there. I do jazz them up with cappuchino chips stirred in. Especially if I want the boys to leave them alone. They love cinnamon rolls, though, so this looks like something that would go over well in our house. mmmmm...love, love, love cinnamon rolls! These sound and look really tasty. I bake...but nothing exciting to report (it's not really my forte)! I haven't been doing much baking other than the occasional loaf of bread. I love the idea of honey in the cinnamon rolls. Sounds really good. This really came out of a "light" cooking magazine? :) It sure doesn't look light! It really looks yummy. I love the way baking cinnamon rolls fill the whole house with their lovely scent! These look amazing! Thanks so much for stopping by my blog and leaving me such a nice comment. 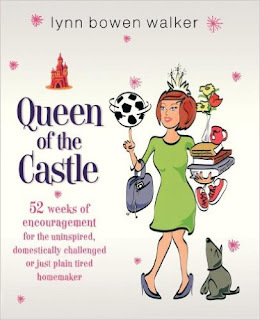 I can't wait to check out your book and try some of your yummy recipies. I am really looking forward to the pork chops as I have a freezer full of pork right now. Thanks for sharing so many wonderful things! I bet your house smells so good after takeing these out of the oven. Smells good, looks goods and tastes good! Win, win! Carpoolqueen, cappuccino chips sound delicious. I've never even heard of these. Guess I'll have to keep my eyes open at the grocery store. Lori, congratulations on your successful Bishop's Cake. I think all three of your tries look yummy. It's cake! Rainy Day Farm, it's fun getting to know you through your blog. I hope you like the pork chops -- I thought they were delicious and worth the (extra bacon-grease) calories, in my opinion :) And I hope that you get to check out my book and it's a blessing to you. Some libraries carry it, so you might want to try there first. 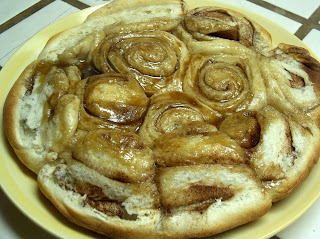 Lynn -- This makes my mouth water, because cinnamon rolls are one of my very favorite foods, which I don't get very often. We've had alot of company in the last month and I've made a light version of poke cake three times and it's always been a hit. I just use the reduced-calorie chocolate cake mix (Pillsbury I think) "poked" with sugar-free raspberry jello and frosted with lite Cool Whip mixed with lite raspberry yogurt. We love it. How did I miss this delicious post. I'm a softie for cinnamon rolls. And with the honey and brown sugar in these, they must be super duper good! Wow!! Here's a hint I learned from my mom making cinnamon rolls as a kid: cut the rolls with dental floss. Just slide the floss under the rolled-up log and pull it together at the top. They come out nice and round every time! What a great hint, Cindy, to use the dental floss to cut the cinnamon roll dough. I'll have to remember that. Thanks.